TEN years ago Two Mile House was just another rural GAA club struggling for numbers but in the last 12 months they’ve taken Kildare by storm. 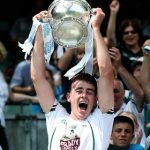 In July Mark Sherry captained the county minors to the Lilies’ first Leinster title since 1991 and last Saturday, Sherry was one of four club minors to play in the Kildare junior football championship final – helping the House win a title has eluded them four times in the last seven years. The week before Sherry, Chris Healy, Adam Burke and Chris Julian were on the losing side in the minor A county final but the fact that the House were even in the final was a triumph in itself. They have been the ultimate underdog but through a combination of hard work and strategic planning, they are producing teams and players that are among the best in Kildare. On Friday night they held their final juvenile coaching session of the year and each week, across Friday night and Saturday morning, they’ll have any number between 170 and 190 children playing football in the name of Two Mile House. They begin at under-6 and year after year, the majority of their young recruits graduate to the next age group. Numbers have always been tight in Two Mile House as you’d expect in a small club but their ambition was never restricted by their limited playing pool. Men like Tony McLoughlin and Johnny Brady had the vision to establish structured coaching for juveniles in the early ’90s. The club’s approach is remarkable considering they have no tradition of success and their location on the outskirts of Naas meant they always had to compete against one of the biggest clubs in the county. Gradually they have grown to the point where this year they beat Naas in the semi-finals of the minor football championship. The Celtic Tiger may be long forgotten now but Two Mile House have reaped the benefits because they had the structures in place to attract new players into the club. To that end the club have a juvenile co-ordinator who liaises with club coaches to ensure things are running smoothly. There is a coaches’ preparation meeting at the start of the season, where videos are analysed and training sessions handed out, while each year the club books a room in the Kilashee House Hotel to assess their performance. “We’ll see what went right and what went wrong and what can we improve. And we’ll kick on again for next year and try and improve. And we’ll do that each year consistently,” says Healy. Success is never guaranteed in sport – and the Two Mile House minors will attest to that having lost under-14 and under-16 championship finals on their way to this year’s county final defeat – but the success of Two Mile House is the number of children training in the club every Friday night. Silverware is almost immaterial when they have the guts of 200 juveniles playing football every week but with numbers like, trophies are almost inevitable. Every team has to have two to three coaches and every coach has to be fully qualified"